Poetry Luck abounds this summer: here visiting friends in London my family was invited to the launch of Be My Next Inspiration, a collaboration designed to support the Young People's Laureate for London project. It was a small but mighty affair, a pop-up stage in a London-proper narrow lane with a fair crowd and a feature we always appreciate: civilized consumption of alcohol in a public space. But wait--go back a second: a Young People's Poet Laureate for a city? 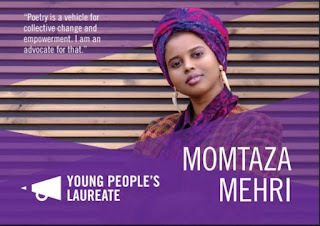 I mean, London is more than just a city, but I can tell you that my locality, large as it is, does not have a poet laureate of any kind, much less one dedicated to being and raising the voices of young people aged 13-25. 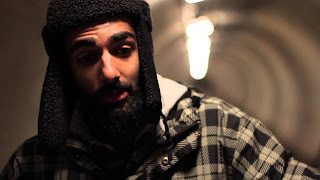 * And on this program was not one inspiration, but SIX young poets performing their work and representing both the wide variety of flavors to be found in the capital but also their shared experience of being young, British and susceptible to marginalization. Here are some ways to enjoy the same poems that we heard on Tuesday night. but if anyone is to tell it let it be me. they start and the story ends. I highly recommend you watch the rest here on BBC Asian Network. This event was sponsored by Spread the Word, the parent literary organization of the Young People's Laureate, and by BUREAU Creative Agency, which produced a publication of the evening's work. View it here. 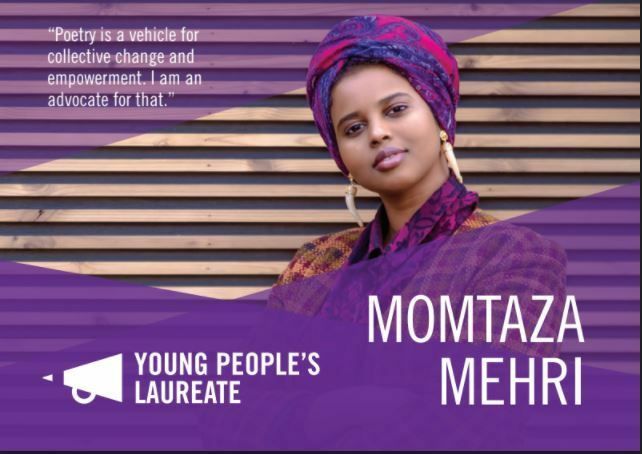 You should know that the Young People's Laureate for London project is in danger--there is no funding in place for next year's program. I made my donation here and maybe you will too, to support #diversevoices and #diversebooks in our English-speaking culture. And of course you can follow all these poets on Twitter! The round-up today is with Mary Lee at A Year of Reading, where you always get more than a year's worth of reading. *However, check it out: Montgomery County, PENNSYLVANIA, does have a Poet Laureate, and our Maryland's capital Annapolis just instituted a Poet Laureate program, which makes me think that Montgomery County, MD definitely needs one. Wow! Just Wow! Wow that you are in London, and Wow that you saw this amazing event and Wow that you shared this brilliant poetry with us. Thanks! Another trio of WOWs: What an event!! What poetry! What poets!! Amazing and inspiring! Thanks for sharing this! Wow, and you just stumbled onto this??? Serendipity, indeed! This is amazing! I hope you're having/or had an awesome trip. Zounds! What an event to stumble upon. How exciting. Each city needs a poet laureate. How serendipitous that you found that event, or that it found you. Wonderful poetry... powerful voices. I'd love to see more youth poet laureates, but we do have a rousing and popular spoken word group here in Denver. These are amazing, Heidi. It's terrific that you were there, and now sharing all with us. Thanks! Such powerful and rich poetry Heidi thank you for sharing all with us–and as Brenda said, "serendipitous that you found that event." Add my wows to the chorus! The talent on display here is amazing! Thank you for sharing! they start and the story ends." Is there a poet laureate (youth or otherwise) chosen for the Gaithersburg Book Festival? I can see that being low-hanging fruit because they might be into that idea. What a fantastic project, poetry is so important for young people, as a healthy means of self-discovery and expression. So glad to see programs like this! What a fabulous experience, Heidi. #stuvoice needs to acknowledged in all arenas but as a young poet laureate that is amazing. I am sure this was one of many fantastic memories from your London trip. "all the world is all of us"